Three EE Seniors Win $10K in "Dream it. Code it. Win it." A Cooper Union team of three electrical engineering seniors have won a $10,000 prize at the third annual Dream It. Code It. Win it. event on May 5. 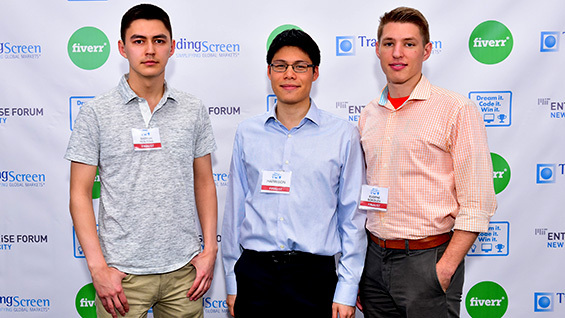 Eugene Sokolov, Harrison Zhao and Sheryan Resutov took home the Fiverr Ingenuity Award for their project, Wi-less Gauss, a glove that allows a user to perform the same functionality as a computer mouse using hand gestures. The trio immediately announced they would donate $1000 of the prize money to The Cooper Union. The project began when they were brainstorming ideas for their senior project. "We first came up with the idea in 41 Cooper Square, sitting in these short chairs. It's uncomfortable to use the mouse," Eugene says. "Sheryan also plays lots of PC games. It would be cool if you could stand from far away and play on a big screen. There's lots of virtual reality applications." 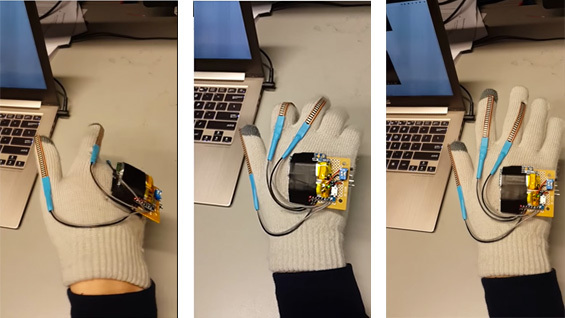 The guys took a cloth glove and attached flexible sensors to the thumb and first two fingers, as well as a gyroscope and Arduino microcontroller to detect motion and position. The data is sent via Bluetooth to a program they wrote that converts the gesture data into actions on the screen. They submitted the project to the "Dream it. Code it. Win it." contest that awards undergraduate and high school students prizes for "engineering solutions for social good." The ceremony took place in The Great Hall. It was organized by Fiverr, MIT Enterprise Forum of NYC and TradingScreen. Harrison has actually won the Ingenuity award twice, having been part of a team last year that included David Katz EE'15 and Caleb Zulawski EE'15. They won for their project "String to String" that digitally encoded writing on a blackboard. Eugene, Harrison and Sheryan haven't decided what they will do with the prize money yet. But they publicly announced they would donate ten percent of the $10,000 to The Cooper Union. Whether they knew it or not, their contribution pushes the senior class past the $4,000 goal set by a challenge from descendents of Peter Cooper. As a result The Cooper Union will receive an additional $5,000 for meeting this part of the Senior Class Challenge. "Without Cooper Union we wouldn't be here," Harrison says. "We're very grateful to the school for this education."